Made from USDA organic apples, Mott’s Organic Applesauce has no added sugar and a delicious taste that kids love. With one serving of fruit per container*, Mott’s Organic Applesauce cups are a healthy, non-GMO**, gluten free snack alternative and a great addition to pack in lunches. They’re also naturally fat and cholesterol free and an excellent source of vitamin C. Treat your family to the great taste of Mott’s and stock up on a 36 pack of Mott’s Organic Applesauce today. * Provides 1 fruit serving per snack container. Per MyPyramid, 1 snack container = ½ cup fruit. Current USDA Dietary Guidelines recommend a daily intake of 2 cups of fruit for a 2,000 calorie diet. 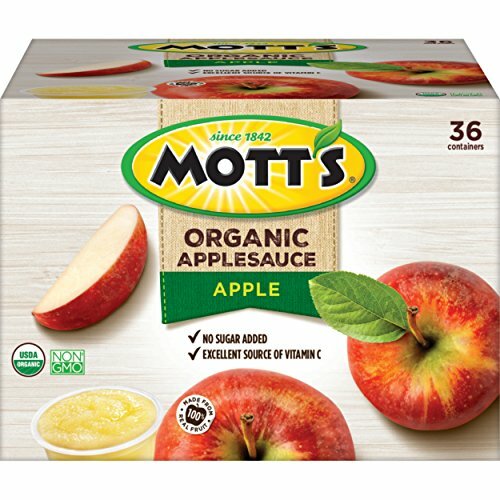 ** Mott’s Organic Applesauce is formulated without GMOs (Genetically Modified Organisms) and is certified organic per the requirements of the USDA National Organic Program. Ingredients made with GMOs are not permitted in USDA certified organic products. Manufacturer: Dr Pepper Snapple Group, Inc. Publisher: Dr Pepper Snapple Group, Inc. Studio: Dr Pepper Snapple Group, Inc.
View More In Applesauce & Fruit Cups. If you have any questions about this product by Mott's, contact us by completing and submitting the form below. If you are looking for a specif part number, please include it with your message.